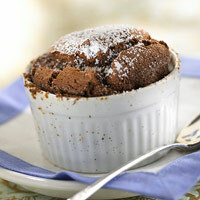 Hunting chocolate souffles recipes was hard! There are so many different ways to make it, and some of them were heart stopping fatty (I wouldn’t be surprised if those were the tastiest souffles!). I narrowed it down to 2 recipes- one which is low-fat but uses flour, and the other which seems a lot healthier (but I don’t have the nutrition information on it) because it doesn’t use flour! See for yourself…My mouth waters more with version 2! 1. pure butter for blended versions like I Can’t Believe It’s Not Butter (which as an Olive Oil blend!). 3. All purpose flour to Unbleached flour…or if you can really love your heart, use whole wheat flour! I can’t tell you the number of times I’ve baked with it and no one has noticed. 4. Granulated sugar to either brown sugar or raw sugar. I’m not a fan of artificial sweetners, but if you must use them, then go ahead! 1. Place eight 6-ounce ramekins in a shallow baking pan; set aside. Preheat oven to 350 degrees F.
2. 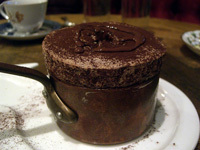 In a small saucepan, stir together 1/3 cup of the granulated sugar, the cocoa powder, flour, and salt. Gradually stir in milk. Cook and stir over medium-high heat until thickened and bubbly. Reduce heat; cook and stir for 1 minute more. Remove from heat. Slightly beat egg yolks. Slowly add chocolate mixture to egg yolks, stirring constantly. 3. In a large bowl, combine egg whites, vanilla, and cream of tartar. Beat with an electric mixer on high speed until soft peaks form (tips curl). Gradually add remaining 1/3 cup granulated sugar, beating on high speed until stiff peaks form (tips stand straight). Stir about 1/4 of the egg whites into chocolate to lighten. Gently fold chocolate mixture into egg white mixture. Spoon into ramekins. 4. Bake about 25 minutes or until knife inserted near centers comes out clean. Serve immediately. If desired sprinkle with powdered sugar. Makes 8 soufflés. Preheat oven to 375 degrees. Butter 6 individual soufflé ramekins and sprinkle with sugar; set aside. Melt chocolate pieces in a metal bowl over barely simmering water, constantly stirring. (Even a small amount of overheated chocolate will ruin an entire recipe.) Once the chocolate is melted, remove the bowl from heat and stir in the egg yolks. In a separate bowl, beat egg whites with salt on medium high speed until they hold soft glossy peaks. Continue beating egg whites on high speed, gradually adding the remaining 1/3 cup sugar, until the egg whites hold stiff glossy peaks. Spoon your soufflé mixture into the prepared ramekins and allow to rest for up to 30 minutes or bake right away for 12 – 15 minutes (slightly longer at high altitudes) until risen with a crusty exterior. Serve with a dusting of cocoa or powdered sugar if desired.